is a most curious barred spiral, approximately 15,000,000 light years distant. 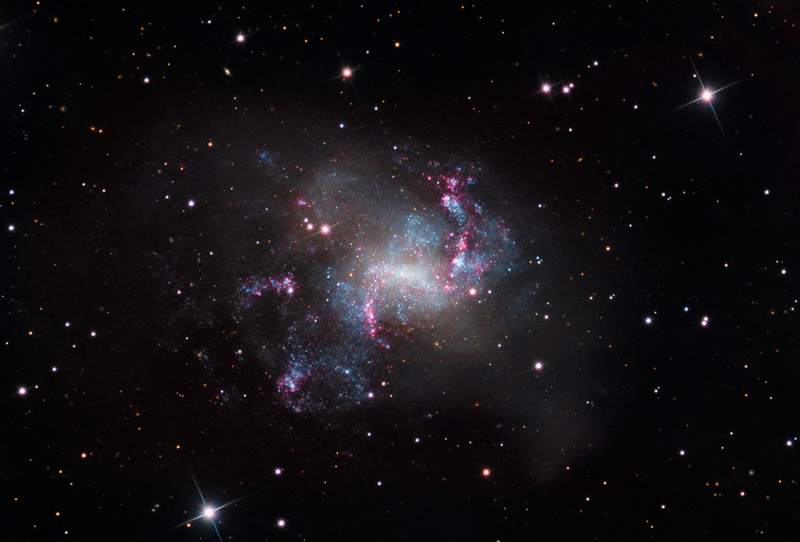 Discovered by Scottish astronomer James Dunlop in 1826, NGC 1313 is a very active starburst galaxy, characterized by numerous pink supershell nebulae, and newly formed bright blue stars along its very lopsided arms. At 50,000 ly across, this galaxy is only half the size of our own. Usually, a galaxy this 'topsy-turvy' has collided with another, but NGC 1313 is not part of a group, has no neighbors, and seems to stand alone. Notice the huge, extended galactic halo. This data was acquired in 2015 at SSRO.